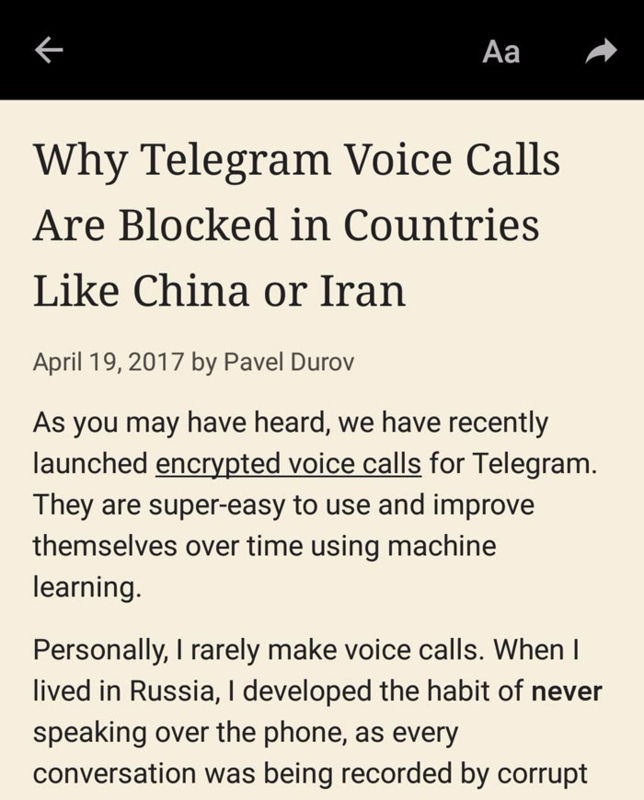 Telegram is my favorite messaging platform. It's secure, ubiquitous across operating systems, and feature-rich. More things get added all the time to the service, such as voice calls and themes, that bring it closer to its competitors like WhatsApp. V4.0 has landed and it brings a few things of note. Video messages. Tap the mic icon to switch to camera mode, then tap and hold to record stylish video messages. Swipe up while recording for hands free mode (works with voice notes). 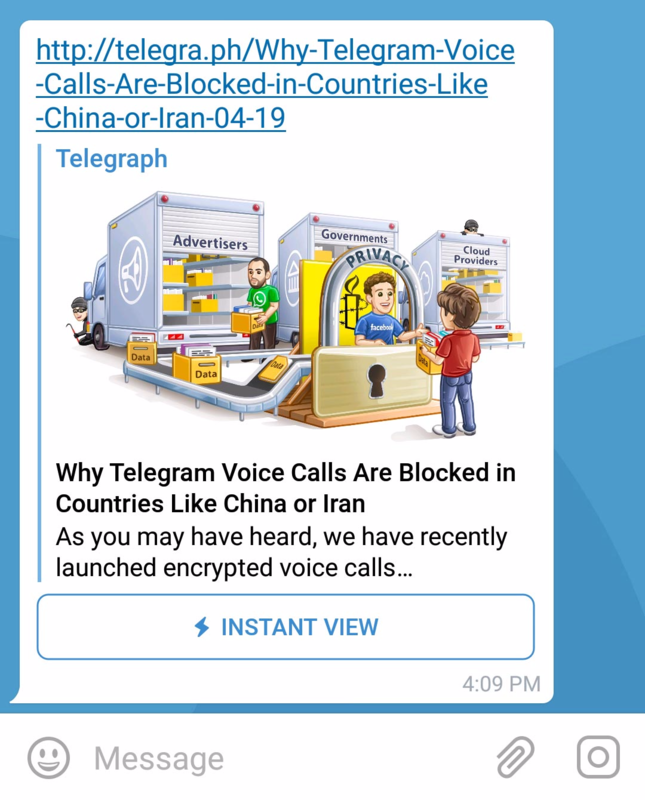 Meet Telesco.pe, where anyone can view video messages from public channels — no Telegram account required. Bots can now accept payments from users. The Instant View Platform is now public and will soon support thousands of websites, including your favorite ones. Recording stylish video messages is different than video calling, which has not been introduced yet (though voice has been). It works pretty seamlessly, all things considered. 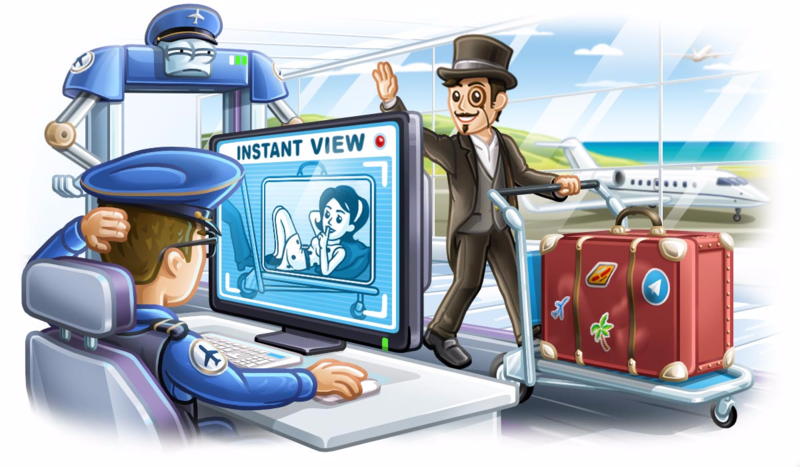 There is also mention of Telescope, which is a hosting platform for video messages. 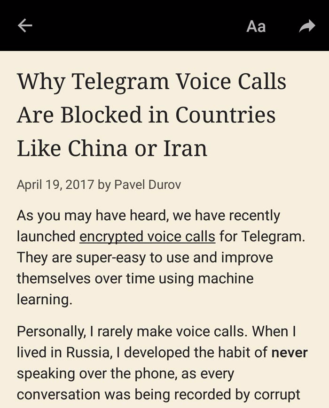 This is more relevant to bloggers or those with some kind of following, and you don't need a Telegram account to view these. 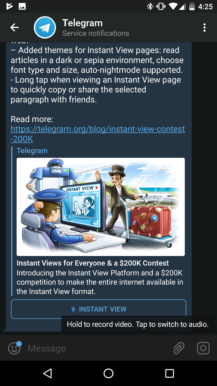 The big news lies in the release of the Instant View Platform, which allows you to view webpages directly in Telegram and the messaging thread. It's meant to be more seamless than even the in-app version of Chrome. It does this by re-wrapping the webpage in an easy-to-read manner. It'll show the text (duh) and any other media like photos or videos. This will work even if the page in question isn't optimized for mobile viewing. 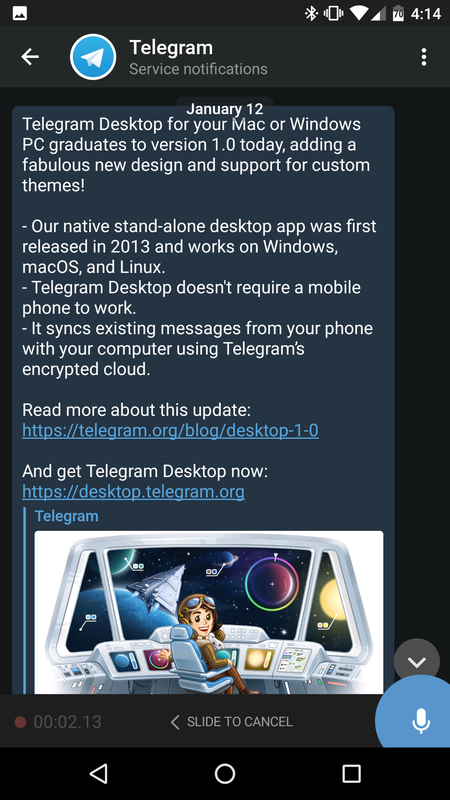 Though it's a brief note in the changelog, Telegram has an entire blog post about bots and payments. 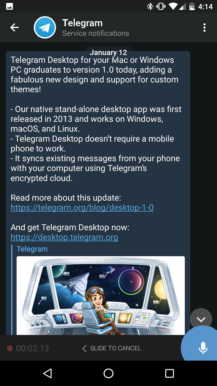 Starting on this version, you can order goods or services right in Telegram through bots (third-party applications that run inside of Telegram) that support them. You might find a "Pay" button below some of these bots' messages; tapping it will prompt you for billing info and then you're done. Accounts protected under 2FA can save card information. 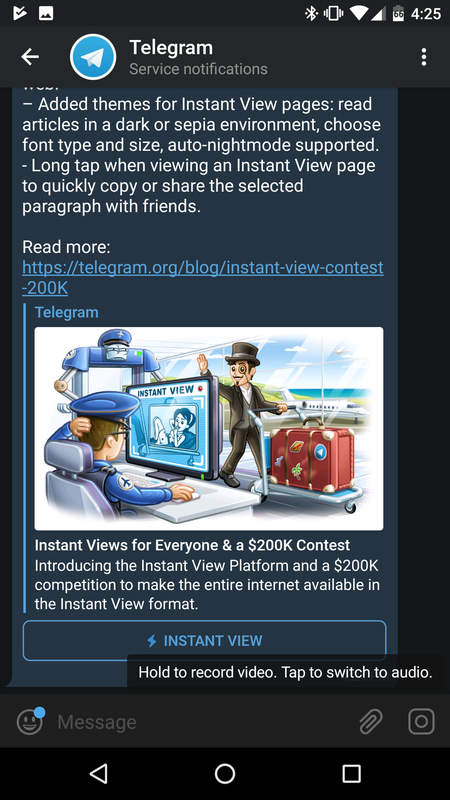 Each instance of Instant View is lightweight and cached on Telegram's servers, so it should theoretically work on most connections. The platform itself is going public, meaning that anyone can create custom templates for how they want Instant View pages to look. There's a contest going on for creating these templates; be sure to check out the source link for more information. 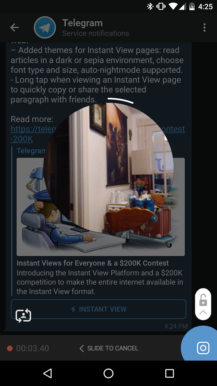 Instant View will also come with settings for background color, text size, and font — there's also an automatic night mode (which might be limited to iOS for the time being). The v4.0 update should be live for everyone in the Play Store, so go check on your device. In the event that you have not received it yet, however, we have it over at APKMirror just for you.